Julius J. Derksen: choir director and farmer; born 27 January 1884 in the village of Sarabash, Crimea, South Russia to Jacob and Anna (Janzen) Derksen. He was the youngest child of a family of 11 children, with one sister Justina dying as an infant. His brothers and sisters were Anna, Jacob, Peter, Martin, Maria, Aron, Justina, Heinrich, Gerhard, and Johann. On 30 April 1910 he married Katharina Martens in the Mennonite Brethren (MB) Church, village of Altona (No. 9), Zagradovka Mennonite Settlement. They were blessed with four children: Jacob, Sara, Katharine, and Julius. Julius J. Derksen passed away on 10 March 1961; Katharina Derksen died on 31 May 1965. At age 16 he embraced the Christian faith. In 1901 he with his family moved to the Terek Mennonite Settlement in the Caucasus, settling in village no. 3. In 1902, Julius was baptized and joined the Talma, Terek Mennonite Brethren (MB) Church, where his church activities included singing in the choir and teaching Sunday school. From 1907 to 1910, Julius directed a choir and band of servicemen while stationed with the Forest Service in the Zagradovka Mennonite Settlement. While singing in the nearby MB Church choir, he met and married Katharina. Later on, Julius directed Mennonite Brethren church choirs in Tiege (No. 8), Zagradovka (1910-1914), and the Blumenort MB Church, Saskatchewan (ca. 1927-1936). World War I and the ensuing chaos interrupted the lives of Julius Derksen’s family in Russia. Julius worked in the forestry service of the Russian military during the war, leaving Katharina and their two young children in the care of her parents, Jacob and Sara (Kröker) Martens. In 1926, Julius, Katharina and their four children immigrated to Canada. They lived with the Johann Derksen family in Gnadenthal, Manitoba for one winter, before they moved to Blumenhof, Saskatchewan. Julius and Katharina Derksen’s family operated a 300-acre wheat farm just south of Blumenhof, next to the Canadian Pacific Railway tracks, and attended the Blumenort MB Church. In 1936, the deteriorating circumstances for Prairie farmers motivated Julius to move his family to British Columbia. 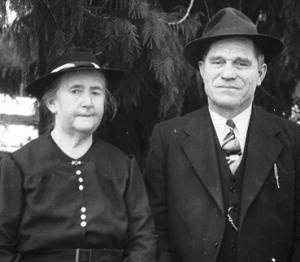 Julius and Katharina Derksen purchased and operated a farm adjacent to the Vedder River on Ford Road, three miles east of Yarrow. In 1946 when their children were grown and married, Julius and Katharina retired to a small farm next to the Yarrow MB Church. Mennonitische Rundschau (5 April 1961). Wiens, Elmer. "Derksen, Julius J." Biographies and Obituaries, Yarrow, British Columbia. http://www.yarrowbc.ca/biographies/derksenjulius.html (accessed 19 October 2009). Wiens, Elmer. “Derksen, Katharina (Martens).” Biographies and Obituaries, Yarrow, British Columbia. http://www.yarrowbc.ca/biographies/derksenkatharina.html (accessed 19 October 2009). Wiens, Elmer. "Derksen, Julius J. (1884-1961)." Global Anabaptist Mennonite Encyclopedia Online. October 2009. Web. 21 Apr 2019. http://gameo.org/index.php?title=Derksen,_Julius_J._(1884-1961)&oldid=141853. Wiens, Elmer. (October 2009). Derksen, Julius J. (1884-1961). Global Anabaptist Mennonite Encyclopedia Online. Retrieved 21 April 2019, from http://gameo.org/index.php?title=Derksen,_Julius_J._(1884-1961)&oldid=141853.